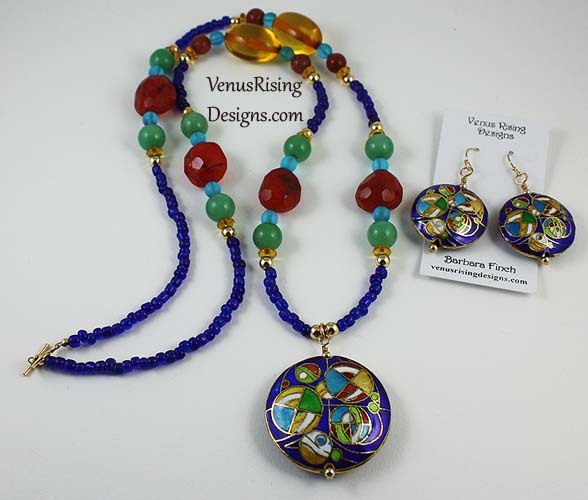 Bring out your inner Bohemian with this unusual necklace set. Cloisonne, rough-faceted carnelian, green aventurine, amber-colored resin and Czech rondelles, light-blue Czech, and cobalt-blue seed beads. Gold-filled wire, beads, toggle clasp, and earwires. Pendant and earwires are wire-wrapped. Necklace is 29".